Richmond’s Original Family Museum is Evolving! As a child, David Neale cringed at the thought of visiting a museum with family or friends. Docents hushing the masses, fragile exhibits protected by rope barriers, and boring history lessons, he knew, awaited him. Then his father took him to the Science Museum of Virginia. It still is. Now a father himself, Neale regularly brings his own son to the Science Museum. And like his father, 13-year-old Luke can’t get enough of the hands-on exhibits. on competitive activities, like walking a tightrope. A former train station, the Science Museum opened in 1977 with one permanent exhibit gallery, The Discovery Room. 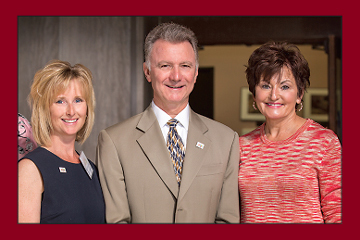 Over the years, the museum has expanded and evolved, with one of its biggest efforts getting underway in 2012. That’s when the museum kicked off its $60 million campaign to transform the entire museum. To date, the campaign has raised nearly $40 million. The main emphasis is connecting the audience to the power of STEM, or science, technology, engineering, and math education, as well as inspiring young people to consider a STEM career. 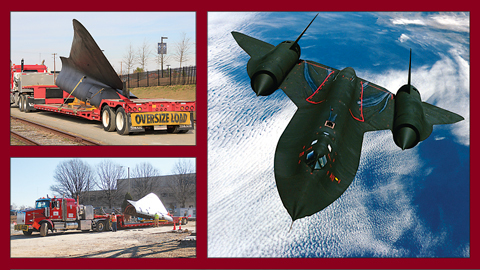 Earlier this year, the SR-71 Blackbird was transported on land from its home at the Virginia Aviation Museum near the airport to the Science Museum of Virginia on Broad Street. There, it was reassembled and displayed in the main concourse. The plane is part of the new permanent exhibit, Speed, which will open by summer. Walk into the Science Museum today, and you’ll feel that change is in the air. In January, the museum transported its SR-71 Blackbird from the Virginia Aviation Museum to its new home inside the main concourse at the Science Museum. Workers disassembled the plane and brought it inside in seven main pieces. They then reassembled the plane, which weighs 43,000 pounds and has a wingspan of 55 feet, on a platform before hanging it from the ceiling. The plane, one of the fastest in history, is part of the Speed exhibit, which will open by summer. The 10,000-square-foot gallery unveils how motion and time intersect across a world of science and technology. Exhibits will display bold demonstrations of the incredibly fast and the hyper slow. Visitors will have the chance to participate in sports activities and discover the speed of a waterfall, erosion, and evolution. 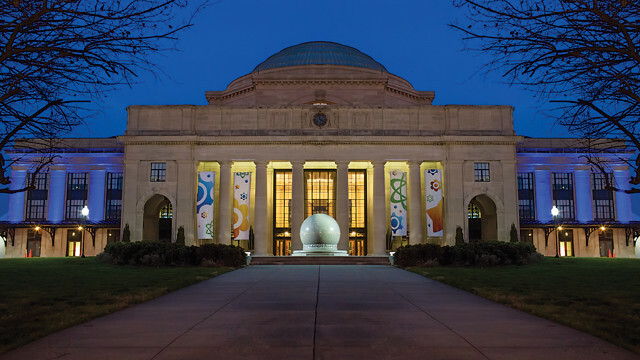 Science After Dark engages families through live programming, popular movies in The Dome, and weather permitting, sky-gazing interaction with scientists and science enthusiasts from the Richmond Astronomical Society. The events are $5 for the general public, and free for members and college students with ID. Parents especially may appreciate – or be alarmed by – an exhibit that details how fast viruses can spread. This powerful interactive exhibit experience allows visitors to not only start a virus, but introduce the vaccine that can slow its spread. The Boost! gallery, for example, offers a new approach to human physiology and the science of staying healthy. Opened in June 2013, this was the museum’s first new permanent exhibition in a decade. It provides visitors with the opportunity to follow their progress over time in a number of challenging activities, like walking a tightrope. 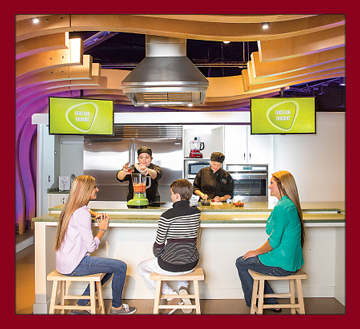 They can play animatronic instruments, sample healthy snacks made in the kitchen stadium, and practice yoga. Boost! was the museum’s first new permanent exhibition in a decade. Here, families can challenge each other to fitness tests, play animatronic instruments, walk on a tight rope, practice yoga, learn to juggle or tie a tie, and sample healthy snacks made in the kitchen stadium. A year after Boost!, the museum upgraded The Dome. The $2.2 million project converted the 5-story dome theater from IMAX to an all-digital projection system. The 76-foot screen is the largest in the state. Screenings include movies, as well as astronomy programs that incorporate lessons from educators. This spring, in addition to Speed, the LightPlace gallery will open. Designed for preschoolers, the exhibit will be themed around light to engage budding scientists. And in 2017, the Dewey Gottwald Center will open. This $12 million project will include new space to be built behind the main concourse of the museum. This community event center will be used for large-scale national exhibits, as well as community events. Future plans also call for taking the science experience outdoors for families, with a science playground, garden, and water feature. Johnson’s sons often conduct their own science experiments on the kitchen table at home, from mixing Mentos with Diet Coke to making goo out of corn starch, glue, and water. His mom doesn’t mind the mess too much because she enjoys seeing her sons stretch their minds with science. According to the President’s Council of Advisors on Science and Technology, economic projections point to a need for approximately one million more STEM professionals than the U.S. will produce at the current rate over the next decade. 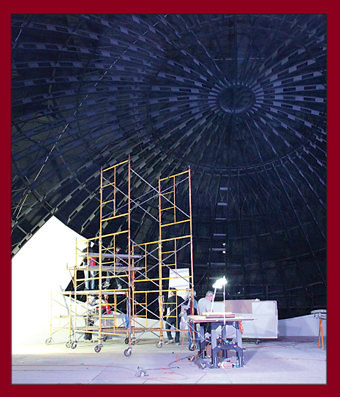 In 2014, a $2.2 million project converted the 5-story dome theater from IMAX to an all-digital projection system. Screenings include science themed shorter films and classic and campy full-length features (like Ghostbusters). The Dome is also the venue for astronomy programs that incorporate science instruction, called Cosmic Expeditions, from museum educators. Students are challenged in the classroom, Dye said, but the Science Museum offers something unique that may steer them to a STEM-related career. “This is another level that gives students a new way of looking at things,” she said. The museum will adapt a school group’s visit to what they are studying in class. Elementary school students might look at the pendulum in the lobby and try to determine a simple pattern, while high school students might study the physics behind it. Before, Dye said, her students might have built a paper airplane and competed to see whose creation traveled the farthest. Today, that experience has evolved to include independent variables – when students change the shape of an airplane, why does it fly farther, or perhaps, crash at takeoff? Conti, who left his position in Norfolk as executive director of Nauticus to come to Richmond in 2008, is excited by the progress made so far. He became the Science Museum’s third director in forty years. With big budget cuts coming at the start of the recession, it was a tough time to go out into the community and ask for money. Instead, Conti visited eighty-five different organizations and observed and listened. With input from thousands, the Science Museum kicked off its fundraising campaign. Noticeable changes will be incorporating more humor, pop culture, and current issues and events into exhibits. Climate change, for example, will be explored in the Speed gallery. Tyler, a ninth-grader at St. Christopher’s, is a member of the Richmond Astronomical Society. 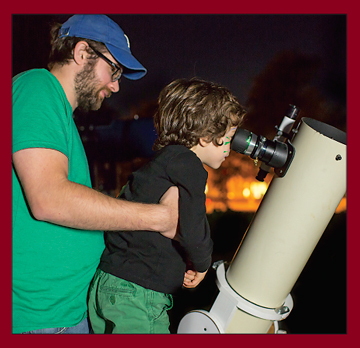 He sets up his telescope monthly on the Science Museum lawn as part of Science After Dark, helping others appreciate the science of the sky. For William Breeden, fourteen, it’s all about the science. William loves Boost!, where he has made 3D drawings and a television commercial for YouTube. He also enjoys testing himself against his father, Billy, in the memory match game. The two also compete to see who can bench press the most weight or jump the highest. That’s exactly what the development team with the Science Museum had in mind. The Science Museum of Virginia is housed in Historic Broad Street Station. Built in 1917, the train station was designed by John Russell Pope, who also designed the Branch House or Branch Museum of Architecture and Design on Monument Avenue, and the Jefferson Memorial, National Archives, and the National Gallery of Art in Washington, DC. Terri Rose understands the challenges families face when they plan an outing for children with disabilities. Loud sounds can turn a fun event into a nightmare. Bright, flashing lights can bring fear to any special occasion. “We are here to serve the entire community, so we want to do everything in our power to make sure that all families have a positive experience when they visit us,” Rose said. Rose is the director of communications and curiosity at the Science Museum of Virginia. Last year, she helped support Autism Speaks, a national autism advocacy organization, by turning the entire exterior of the Science Museum building blue with the help of lights. Rose, the godmother to three children on the autism spectrum, was more than happy to lead the grand illumination effort last spring. She had no idea, however, what it would mean for families in the greater Richmond community. According to the U.S. Centers for Disease Control and Prevention, about one in sixty-eight American children is identified as on the autism spectrum. That’s a ten-fold increase in forty years. As Rose began talking to the parents of children with disabilities, including autism, she discovered the museum was not serving this important population. So she formed focus groups and met with healthcare providers and caregivers. She huddled with officials from Walt Disney World who had experienced much success in setting up a sensitivity matrix guide at their resort. She set her sights on doing the same at the Science Museum. The Curiosity Guide will be available to all families this summer at the museum and online. It will detail all the exhibits, programs, and events, as well as movies and programs showing in The Dome. The guide will include tips for planning a successful visit. The key component will be an in-depth review that addresses the sensory integration of each program and event, including: smells, flashing lights, loud noises, periods of darkness, bumps, fast action, heat, and the element of surprise. These features often are challenging for guests with disabilities. “This will be a great resource for anyone needing a little more information, so they can plan the best visit for their families,” Rose said. The guide will be about forty pages and include a sample itinerary. If a child is extremely sensitive to loud noises or bright lights, for example, the guide will point out exhibits and events that are less stimulating and therefore, a better match. “It takes the guess work out of it,” Rose said. While the project started with a focus on the autism spectrum, it has grown to include almost any disability, including brain injuries and anxiety disorders. It even addresses the needs of seniors who suffer from motion sickness who may want to stay away from certain shows in The Dome. And visitors with physical disabilities will find it helpful in avoiding or getting assistance for exhibits that require agility.